Can you feel the feast tonight? If love leads you to the Gold Coast this Valentine’s Day (that’s February 14 for our forgetful pals in the back), hit up any one of these saucy boys to avoid disappointment… and sleeping on the couch. Swap that blank look on your face when they ask if you’ve remembered to book in a Valentine’s Day dinner with a glass of Ruinart Blanc de Blancs champagne. Nineteen at The Star will be hosting a sky-high five-course set dinner with a glass on Ruinart on arrival, being the perfect start to a night full of feasting on oysters, caviar, roast highland duck with quince and black garlic, topped off with Nineteen’s signature chocolate gold bar. All that goodness lands at $150pp, and you can secure your spot here. Have a luxuriously troppo V-Day at Burleigh Pavilion’s blush swathed restaurant. 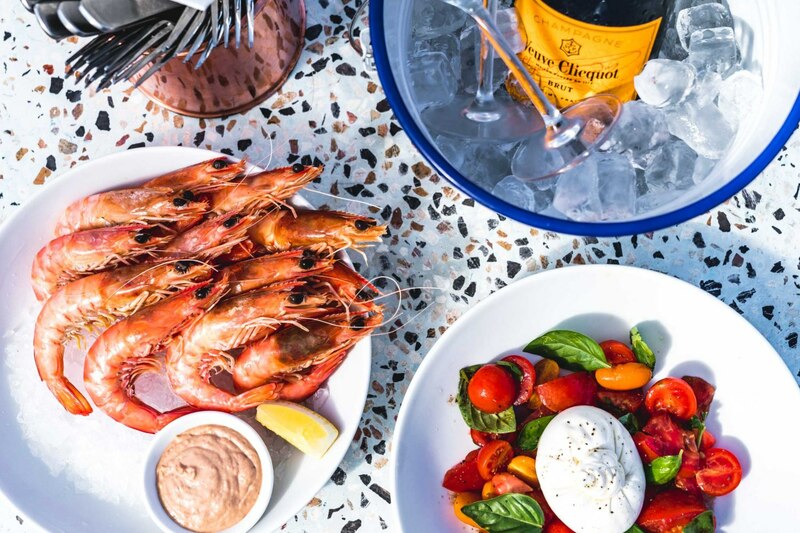 The Tropic will be hooking you up with a glass of NV Veuve Clicquot Rosé on arrival, before a set menu swoops in to steal the show (giving unbeatable beach views a run for their money). A bespoke Mediterranean-inspired menu will feature the likes of freshly shucked oysters, kingfish crudo, king prawns and a chocolate, raspberry and beetroot concoction for dessert. You can book your pick here. Greeks are all about passion (and food… and babies), and you’ll definitely feel the love on your plate tonight. Taverna has a Greek-inspired share plate menu linked up for your Valentine’s Day date, complete with a glass of champers on arrival (not a shared glass, some things still value the solo system). An indulgent shared dessert will complete you, making for one big fat Greek Valentine’s Day to remember. Book your dinner at $89pp here. Mother Nature is ready to set the table with a gorg four-course set menu. BKA has made it clear that whether you’re a couple, single, or want to do something nice with your mates, there’ll be ready and waiting with a cocktail, mocktail or craft tap beer on arrival – and that’s wholesome af. You can expect to indulge in cheese boards, pistachio-macadamia crusted tofu with mushroom and potato skewers, mixed greens, massaman curry sauce and yellow rice, and berry coconut panna cotta. Sit pretty in plant-based by securing your spot here. Make a move on Moo Moo for a stunning three-course V-Day din. $95 will be your ticket to your choice of entree, main and dessert, which could very easily be our selected combo of calamari with tartare, miso and frisse, buffalo ricotta gnocchi with wild mushrooms, tarragon and stracciatella and a dessert tasting plate for two. Don’t have a cow, man – just book here. Single? We haven’t forgotten about ya. Grab Topgolf’s Single and Ready to Mingle party by the balls and see where the night takes you over a bit of golf, a lot of bubbly and beer, nibbles and a DJ set. There’s no way you’ll feel alone in a room full of singles (unless no one’s talking to you. Let’s hope for the best). Get tickets here.